0 Comments Published by daveterry on Monday, November 21, 2011 at 6:38 AM. 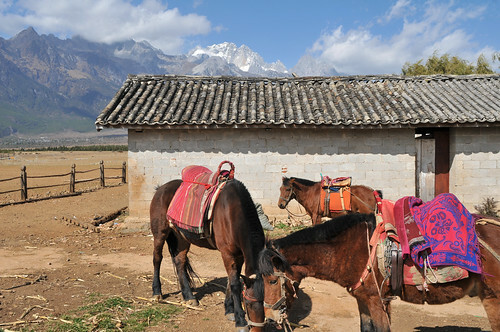 We took a few days and went to Lijiang, Shuhe, and Baisha with some friends from America. 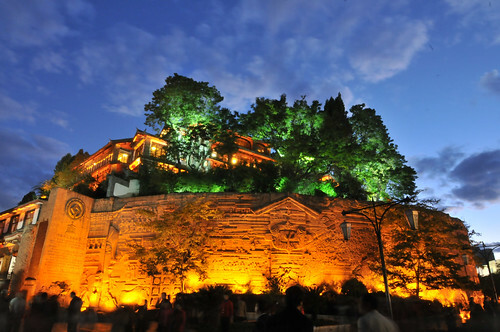 Lijiang old town is a beautiful place to see in China. The small town has streams running under cobble stone foot bridges and through the town square. Shuhe is similar and a little less crowded. It's just a bus ride (or taxi) of 20 minutes out of Lijiang. The area has grown since we last went in 2008. 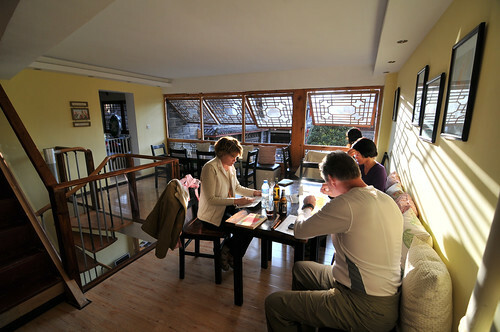 Most of the attractions (Tiger Leaping Gorge, Snow Mountain, etc.) have doubled in price. For example, we were surprised that just to get into the Snow Mountain park it cost 180 RMB (about $30) and then another 105 RMB ($15) to go up the mountain. That's $45 dollars US to see some snow! Instead we walked around the towns and talked to the local people. 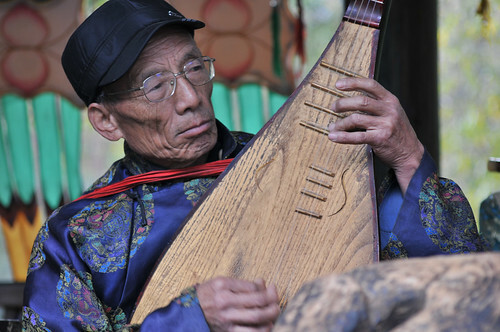 We snapped pictures of old men playing chess and listened to local music on fascinating instruments. Overall it was a better experience for us. Besides, the tourist sights were crowded with people. Taking a little local bus and visiting with the locals was much more enjoyable. We enjoyed talking with Mr Li in 龙余湖 Longyuhu. 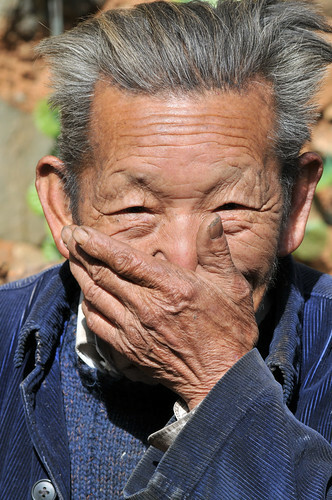 He had been in the Chinese army for some years back in the 50's and had a lot to talk about. He lived in a very modern looking stone house with an old tractor in front of it. I asked if I could take a picture and he was very agreeable. He asked me if I'd like to come inside, so we stepped into his entry area and snapped this picture. His town was at the base of Snow Mountain. The weather was perfect and the people friendly. One old man was squatting over a pile of boards, pulling out nails and straightening them. Our visiting friends talked with him while I snapped pictures. Further up the road we found some horses grazing under the backdrop of Snow Mountain. On our last visit we rode for four hours and only paid $15 dollars, and the ride included a Naxi meal. This time they wanted $30 for an hour. No tours were around for miles. Some of the horse handlers were sitting in the shade playing cards. So we tried to get a ride for less. We told them that the horses were not doing anything anyway. No riders, no money. We asked for a discount. But the woman in charge was not going to hear of it. She was firm and wouldn't give up a penny. She complained that we'd only make the horses sweaty and that would mean more work for her later, when she had to wipe them down. It seems that folks here just don't understand the meaning of tourism. They are still stuck in an old mindset. The government gives them a subsidized job to tend a store or tour center. 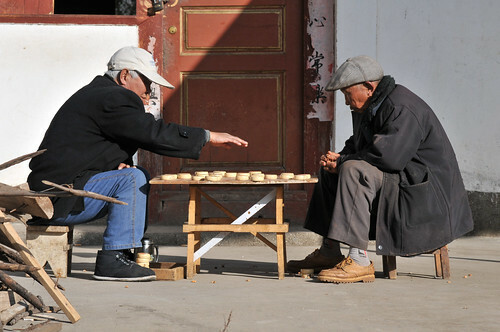 They sit around and gamble playing cards or mahjong and smoke and visit among themselves. They don't care if anyone comes to buy or not. In fact, tourists are an irritant. Free enterprise is still unexplored territory. The ones that "get it" are doing well (like our friend Eric above). On the way back to our inn in old town we passed some guys skinning and cleaning two deer. They had started when we left the town earlier that morning. Here, late at night they were still at it. 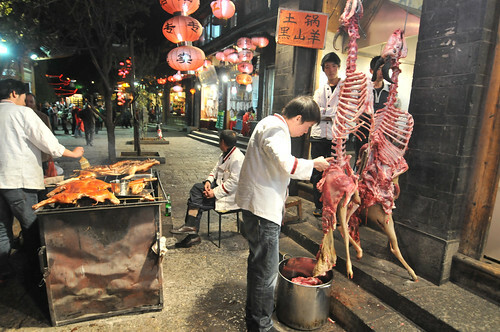 They skewer the fresh meat and season it over an open fire. It smelled great but we had already enjoyed some goat meat prepared the same way. Good stuff. Besides these were just snacks. We were looking for something more substantial. And we found it. Not too far from the water wheel of old town Lijiang was an East Indian restaurant. He had just opened up a week ago. He served us chicken, beef, and vegetable curries with soft, fresh pitta bread, and then later cheesecake and brewed coffee. It was enough to feed the four of us, and it cost just $30 US. 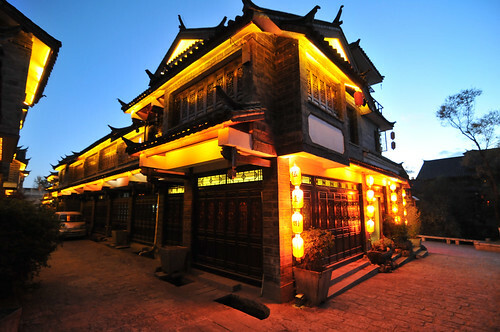 I recommend his place if you are visiting Lijiang. He didn't have his website up yet but the restaurant is called "Maya Cafe." Check it out. You'll be glad you went! We finally made it back up to our inn on the hill and watched the moon come up over the city. We opened a bottle of imported wine and talked of our experiences of the day while sitting on our veranda. Travel is such an exhausting endeavor. Music: De Ushuaia A La Quiaca and Pampa by Ronroco. Happiness is not having what you want. It's wanting what you have.